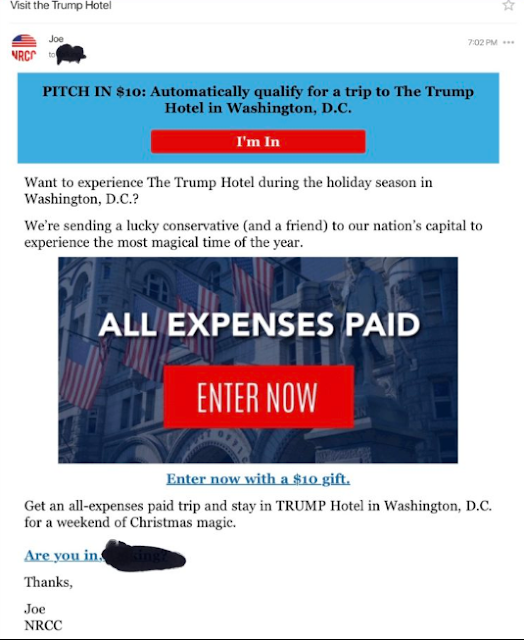 But in all the merriment about Ivanka's questionable taste and the juxtaposition between the tax cuts for the wealthy she's helping to sell and the lives of all those blue-collar workers her father supposedly represented with his "populist" campaign, few people have stopped to ask how it can possibly be that a top adviser to the president still owns a "lifestyle" company in the first place. We have become so inured to the outright corruption of this White House that we simply accept the fact that all the Trumps and Kushners have merged their business interests with their jobs working for the president. In case you were wondering, the Trump Hotel is doing very, very well what with lobbyists and foreign dignitaries spending huge wads of cash there over the past year. Imagine that. Scions Donald Trump Jr. and Eric Trump are handling the business, with Trump himself looking over some quarterly reports while Ivanka has supposedly withdrawn from day-to-day involvement with the family business and her own company. Nonetheless, Ivanka's brand is everywhere, and she is still looked upon by the media as the quintessential Trump woman: a beautiful, brilliant businesswoman with great style and exceptional savvy. But it turns out that her brand, like her father's, is more hype than substance. Ivanka is beautiful and her style is admired by many. But her business history is nothing to be proud of. Recent investigations into the Trump real estate empire show that she had been involved in the company's most suspicious dealings with shady oligarchs and mobbed-up money launderers. If Donald Trump is in the crosshairs of federal investigators for nefarious financial transactions with disreputable characters, his daughter will likely be caught in that same net. Reuters and NBC reported over the weekend on a particularly unsavory deal in Panama called the Trump Ocean Club, which Donald Trump dubbed Ivanka's "baby." It was the Trump Organization's first international hotel venture in 2007, and Ivanka was the lead family member on the project, working closely with a Brazilian development broker named Alexandre Ventura Nogueira. He put together much of the financing for the deal, and let's just say it wasn't exactly on the up-and-up. Involved in Ivanka's "baby" was a money launderer from Colombia who is currently incarcerated in the U.S., a Ukrainian human trafficker and a Russian investor who was jailed a few years earlier for kidnapping and threatening murder in Israel. Nogueira himself was arrested in Panama on unrelated fraud charges and fled the country; there are still four criminal cases pending over the Trump project. Ivanka apparently claims not to remember the man, although she knew him well enough to make a promotional video with him. Another notorious Ivanka project was the 2014 Trump Tower Baku in Azerbaijan, which she personally oversaw. This was the project that, according to a recent New Yorker report, was partially funded by the Iranian Revolutionary Guard and served as a cash laundromat for the country's government. This was no hands-off arrangement. Ivanka and the company were heavily involved in all the details, from the interior paneling to the landscaping. According to experts, this was unusual for this sort of deal and indicates a level of personal attention that exposed the Trump Organization to serious legal trouble. Clearly, he knew exactly what kind of assignment he'd given his daughter. Several senators have called for an investigation into this project, which was finally shelved after Trump was elected. 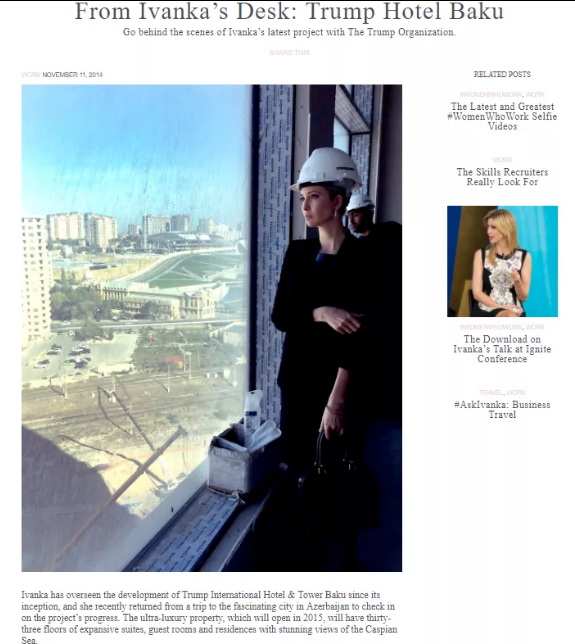 According to Think Progress, "at some point earlier this year, Ivanka removed all information about the Azerbaijan project from her website, although it remains available via Internet Archive." It's very difficult to believe that the Trumps didn't know that they were involved in these massive corruption schemes. The evidence was right in front of their eyes. Now that evidence is right in front of an investigative team that has a mandate to go wherever the evidence takes them, Ivanka Trump is as legally vulnerable as her husband and the rest of her family.